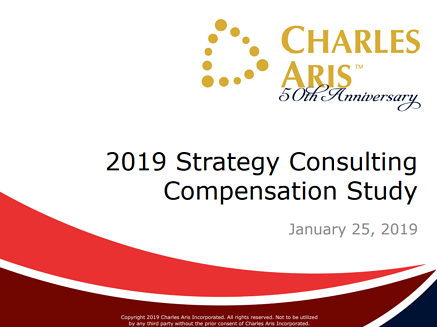 Charles Aris Strategy Consulting Compensation Study! Over the course of Q4 2018, Charles Aris team members surveyed more than 1,480 people, 528 of whom are current strategy consultants. More than half of those individuals are current Big Three consultants for McKinsey & Company, Boston Consulting Group and Bain & Company. All compensation points were collected anonymously and in compliance with pay equity laws currently in effect around the United States and U.S. territories. We're confident that this report will serve as a useful resource as you address your organization's mission-critical hiring needs and manage your own career trajectory. Please reach out to any member of our Strategy & Corporate Development recruiting practice to learn more. Our team is also excited to announce the first annual former consultant compensation study set for release March 29, 2019.